Radial aircraft engines, automobiles, motorcycle and jet engine manufacturing, founded in 1916. BMW is also the parent company of Rolls-Royce Motor Cars. In 1918, BMW was forced to cease aircraft engine production by the terms of the Versailles Armistice Treaty. 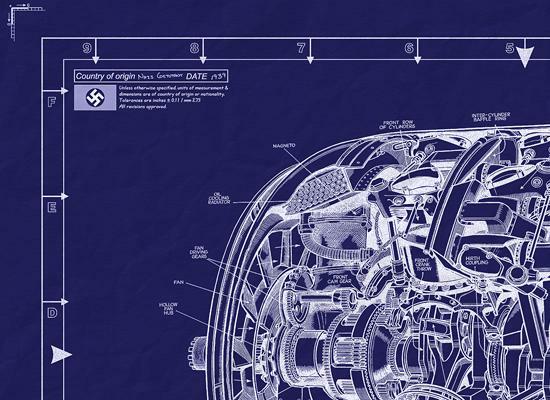 With German rearmament in the 1930s, the company again began producing aircraft engines for the Luftwaffe. First, its massive bulk up front helped protect the pilot. Second, it could absorb a lot of battle damage and keep running; like the American P-47, tales spread of Fw 190's making it back to base with a cylinder head shot away. This powerful 14-cylinder, twin-row supercharged radial engine… powered some of the finest aircraft of WWII, including the remarkable Fw-190 fighter. Continued from above… 22 versions of the BMW 801, of which 11 were built in series. Overall, approximately 21,000 engines were produced of this type. The BMW 801 was used in a number of German military aircraft of World War II. Advanced design characteristics resulted in a remarkably compact installation, adequate cylinder cooling was obtained using pressure baffling augmented by a magnesium alloy fan geared to turn at 1.72 times engine RPM (3 times propeller speed). An oil tank and cooler are positioned in the nose bowl and are armor plated. The engine mount ring is a sealed unit of square cross-section and also acts as a hydraulic fluid reservoir. Additional streamlining was achieved by the introduction of drag-inducing cowl flaps. BMW (while based in Munich) were manufacturing Pratt and Whitney radials under license in the 1930's and used this experience to develop its own twin row engine. Despite this, it can be considered an original design incorporating fuel injection and other advanced German features. Most revolutionary was the hydraulic-electric 'brain' unit, operated by a single control which was the pilot's throttle lever. It automatically adjusted fuel flow, mixture strength, propeller pitch setting and ignition timing. It also cut in a second stage of the supercharger at the correct altitude. The pilot could, if required, manually set the propeller pitch without altering any of the other settings. It was an electromechanical system, which controlled the speed of the engine rpm, fuel injection, the supercharger compressor operation, the pitch of the propeller ... everything necessary for engine performance was the best in every phase of flight, allowing the pilot to concentrate on combat. Founded originally in 1916, this company, under the name of Bayerische Motoren Werke A.G., achieved prominence towards the end of the War 1914-18 by producing a vertical engine, generally of the normal German six-cylinder type, with oversized cylinders and a high compression ratio for operation at heights. Shortly after the War, the company took up the manufacture of Kuntze-Knorr compressed-air brakes for railway carriages and wagons. Subsequently the engine department, the manufacturing rights of the various engines, and the name of the company were bought up by the Bayerische Flugzeug-werke, which changed its name to BMW Flugmoterenbau G.m.b.H. In 1939 the BMW concern took over the Brandenburgische Moterenwerke G.m.b.H. and this company became known as the BMW Flugmotoren-werke G.m.b.H. 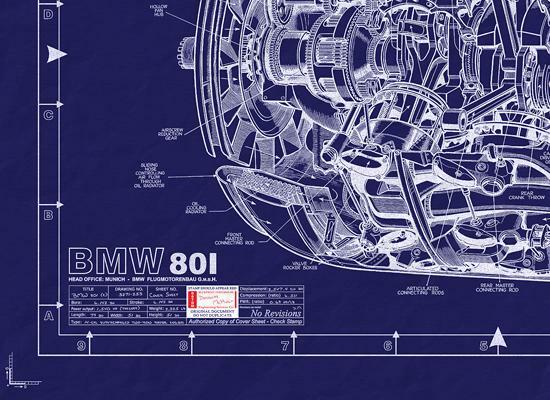 The BMW 801 was the first high-performance radial air-cooled engine of completely "new design" to be produced in Germany after the outbreak of War. The introduction of positive air-cooling, incorporating a cooling-fan in the cowl nose opening, operating at approximately three times the airscrew speed, and a system of internal baffles had made it possible to eliminate all external cowling excrescences. Positive air pressure built up in the cowling in front of the engine was used for cooling the cylinders, cylinder-heads, crankcase, accessories and the oil, as well as for combustion. Air could also be taken from within the cowling for cabin and wing heating. 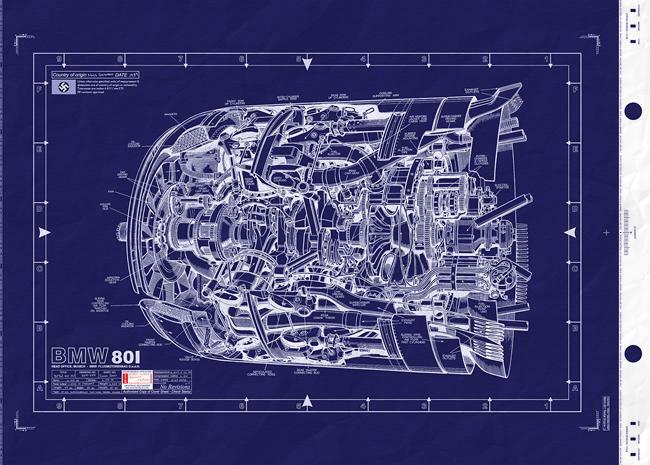 The BMW 801 was designed with a single-stage centrifugal supercharger with two automatically changing speeds, direct fuel injection and a centralization of controls which permitted the operation and control of boost pressure, engine speed, ignition timing and blower speed by a single lever. In addition, the engine was fitted with a VDM airscrew pitch-changing and constant-speed regulating device which in normal operation automatically maintained the selected speed by oleo-hydraulic means. The BMW company began preliminary work on jet propulsion power-units in 1934 and its first turbo-unit, the 109-003, was first run in August, 1940. THE BMW 801 A, B, C AND L.
The main difference between the 801 A, B, C and L was in the type of airscrew control fitted. All had right-handed rotation except the 801 B. The complete cowled power-plants incorporating these engines were designated 801 MA, MB and ML, the 801 C being supplied only as a bare engine. Type: Fourteen-cylinder two-row air-cooled supercharged radial with direct fuel injection. Cylinders: Bore 156 m/m. (6.15 in. ), Stroke 156 m/m. (6.15 in.). Capacity 41.8 liters (2,560 cub. in.). Steel barrels with screwed and shrunk-on light alloy heads. One inlet and one exhaust valve per cylinder, both facing aft, with aluminum-bronze inlet and steel exhaust valve-seats. Two sparking-plugs per cylinder facing forward, one inboard of each valve. Fuel injection nozzle facing aft. Cylinders attached to crankcase by closely-spaced small diameter studs with vertical serrations so that they can be positioned relatively close to the barrel and only a narrow flange is required. Connecting Rods: H-section single-piece steel master-rod and six auxiliary rods in each bank of cylinders. Master-rods in No. 9 front and No. 8 rear cylinders, which are the lowest on the port side of each row. Lead-bronze big-end and bronze little-end bearings. Crankshaft: Two-throw four-piece crankshaft on one central single-row ball-bearing and two roller-bearings in forward and rear sections of crankcase. Shaft consists of two central webs each with crank-pin and half the centre journal, and front and rear webs with integral journals. The halves of the centre journal are hollow and screw-threaded internally. A screwed bushing splined internally for the assembly tool draws the halves together against differential threads, the actual joint being in the form of a Hirth serrated coupling. The hollow crank-pin ends are tapered internally and externally and are pressed in bronze bushes in the outer webs and secured by copper-plated steel bushes which are pressed into the ends of the pins. The bushes are threaded internally for an extracting tool. All four webs have integral balance-weights and provision made in the rear web for a torsional vibration damper. Crankcase: The main case is of steel and in three sections split on the centre-lines of the two rows of cylinders. Bolted to the flanged forward section is the light alloy housing enclosing the airscrew reduction gear, cooling fan increasing gear, magneto drives and airscrew pitch-changing mechanism. At the rear of the main case is the flanged blower casting in two parts. The front section contains the forward bearing of the blower shaft, the impeller and has fixed baffles and air intakes round its circumference. The rear section contains the supercharger drive, rear bearing of the blower and various accessory drives. These two sections and a channeled and bossed light alloy mounting ring seated on the rear face of the rear section are assembled to the steel crankcase by long bolts. The accessory housing containing drives for the fuel feed and injection pump, control device, starter, etc., is separately bolted to the rear half of the blower casing. Valve Gear: One inlet and one exhaust valve per cylinder. Exhaust valves are sodium-cooled. Totally-enclosed valve gear with overhead rockers, tubular push-rods and roller-ended tappets facing forward in the front cylinders and aft in the rear cylinders. Two cam rings, one forward and one aft, driven at one-eighth crankshaft speed and in same direction. Pressure lubrication of valve gear through push-rods. Induction: Two flat intakes with dust grids located inside cowling are fed with air delivered by the nose fan through shallow ducts, one on either side of the cowling, which by-pass the cylinder baffling system. After passing through the blower the air is delivered by individual pipes from the blower casing to each inlet port. Two intake throttles are geared to an oil servo-operated variable-datum boost control. Supercharger: Two-speed centrifugal blower. 24-bladed semi-shrouded light alloy impeller has hollow shaft through which rear extension of crankshaft carrying the supercharger and accessory drive gears passes. The drive unit comprises an output shaft on which are freely mounted two gears with multiple-plate clutches and a sliding selective clutching member which is hydraulically-operated from the control unit. For the higher ratio (7.46 : 1) the drive is taken directly from the crankshaft pinion to the forward gear on the output shaft. The low ratio (5.07 : 1) is obtained when the rear free gear is clutched. Fuel Injection: A Deckel cylindrical fuel-injection pump, flange-mounted on rear of engine, comprises fourteen individual pumping elements lying parallel to and arranged concentrically around the longitudinal axis. The pumps are actuated by a three-nosed cam driven through a train of spur gears from the crankshaft at one-sixth engine speed. A pump forces the fuel from the main tank through two lines to a float and pendulum de-aerator and thence to a chamber in the rear engine cover, from which tangential passages lead to the axially-mounted tube projecting into the common fuel gallery for the pumps. The metered fuel is fed through long high-pressure lines to the injector nozzles, one to each cylinder, mounted between the valves. Ignition: Vertically-mounted twin Bosch ZM14 CR 10 magneto, mounted on nose casing with single drive unit from front end of crankshaft, serves two plugs per cylinder, one inboard of each valve. Airscrew Drive: Epicyclic reduction gear .542 : 1 ratio. Airscrew shaft mounted in lead-bronze bushing in nose of hollow crankshaft and on thrust ball-bearing in nose of gear casing. An external gear on the casing of the epicyclic unit drives the cooling fan through a lay-shaft at 1.72 times crankshaft speed. The airscrew pitch-change is by hydraulic pump mounted on the engine nose casing, the pump being controlled by an electric motor. An adjacent hydraulic speed governor interconnected with the throttle control constitutes an automatic control selected by the control unit. Electrically-operated fluid and slinger-ring de-icing system may be fitted. In order to pass fluid through the fan to the airscrew two slinger-rings are employed, one on the fan with passages drilled through the fan-hub to the second slinger-ring on the airscrew. Lubrication: Oil is fed from the tank by an auxiliary pump to the main pressure pump via the oil-coolers in the leading-edge of the cowling and thence through an Auto-clean-type filter. A relief-valve limits the oil pressure through the coolers to a maximum of 12.5 atm. (184 lbs./sq. in.) and a further capsule-controlled temperature-sensitive valve maintains the main supply to the engine to a normal pressure of 8-9 atm. (118-132 lbs./sq. in.). The return of oil from the crankcase, supercharger case and accessory mounting is from the oil sump via the main return pump. Two additional return pumps drain the gear casing and a further pump drains the valve-rocker boxes. A small oil tank at the rear of the engine supplies a separate oil-pressure pump to lubricate the injection pump and boost control oil servo controls. Accessories: Accessory casing bolted to rear of blower section. Extended end of crankshaft passes through hollow impeller shaft and carries the auxiliary drives and starter dog for the coaxially-mounted Bosch electric or hand-energized inertia starter. The auxiliaries directly driven from the crankshaft by spur gears include a 2-kilowatt Bosch generator, an Askania vacuum pump, a Maihak fuel supply pump and the fuel-injection pump. Cooling: Low-drag cowling 1.320 m/m. (52 in.) in diameter and 1,473 m/m. (58 in.) long closely fits the engine and is supported by front and rear rings and an inter-cylinder baffle, all attached to several valve rocker boxes by rubber-bushed bolts. A twelve-bladed fan 813 mm. (32 in.) in diameter and driven from the airscrew reduction gear at 1.72 times crankshaft and 3.17 time airscrew speed, rotates in the cowling front opening. The cylinders and heads are closely baffled to ensure that both rows of cylinders are scavenged separately by compressed fresh air from the pressure region behind the fan. To avoid cooling losses the cylinder head baffles are extended to form a dividing wall between the two rows of cylinders and are sealed to the cowling by a rubber ring. Oil coolers are located in the leading-edge ring of the cowling and air from inside the cowling passes through them in reverse flow and out through an annular slot. In the 801A and 80IB models the width of this slot and, consequently, the flow of air through the cooler, can be varied by a ring which may be moved fore and aft electrically. Exit of air which has passed over the cylinders is through an annular slot at the trailing-edge of the cowling. In 801a and 801b models this slot is controlled by an electrically-operated sliding gill ring. Exhaust System: All exhaust pipes extend aft from exhaust port and pass through the rear cowling slot. Control Unit: A master-control ("Kommandogerat") controls boost pressure, engine speed, mixture, ignition timing and supercharger speed change so that the pilot can chose the operating conditions of his power plant by means of a single operating lever. For the circulation of the required hydraulic pressure and lubricating oil, special pressure and drain pumps are fitted. These operate a circuit of thin temperature-resisting oil. Dimensions: Overall length 2,006 mm., Diameter (801 A) 1,307 mm., Diameter (801 C) 1,290 mm. Weights: (801 A) 1,213 kg. (2,669 lb. ), (801 B) 1,228 kg. (2,702 lb), (801 C) 1,055 kg. (2,321 lb.). Performance: Take-off and emergency 1,600 h.p. at 2,700 r.p.m. at 1.32 ata. at sea level, 1,380 h.p. at 2,700 r.p.m. at 1.3 ata. at 15,100 ft. Climbing 1,460 h.p. at 2,400 r.p.m. at 1.25 ata. at sea level, 1,310 h.p. at 2,400 r.p.m. at 1.25 ata. at 14,500 ft. Maximum cruising 1,280 h.p. at 2,300 r.p.m. at 1.15 ata. at sea level, 1,170 h.p. at 2,300 r.p.m. at 1.15 ata. at 15,000 ft. Fuel consumption .506 lb./h.p./hr. maximum cruising, sea level. THE BMW 801 D, G AND Q. Similar in general construction to the 801 A but operating on 96 Octane fuel. The 801 D was a bare engine, the 801 G was a power-plant for multi-engine installations, and the 801 Q was fitted with a bi-fuel system and provision for nitrous-oxide injection. Compression Ratio: 7.22 : 1. Supercharger Drive Ratios: 5.31 : I and 8.31 : 1. Performance (801 D and G): Take-off and emergency 1,700 h.p. at 2,700 r.p.m. at 1.42 ata. at sea level, 1,440 h.p. at 2,700 r.p.m. at 1.42 ata. at 18,700 ft, Climbing 1,500 h.p. at 2,400 r.p.m. 1.32 ata. at sea level, 1,360 h.p. at 2.400 r.p.m. at 1.32 ata. at 17,000 ft. Maximum cruising 1,300 h.p. at 2,300 r.p.m. at 1.2 ata. at sea level, 1,215 h.p. at 2,300 r.p.m. at 1.2 ata. at 18,000 ft. Fuel consumption .54 lb./h.p./hr. maximum cruising, sea level. THE BMW 801 E, F AND S.
Similar in general construction to the 801 D but fitted with different supercharger gear ratios. 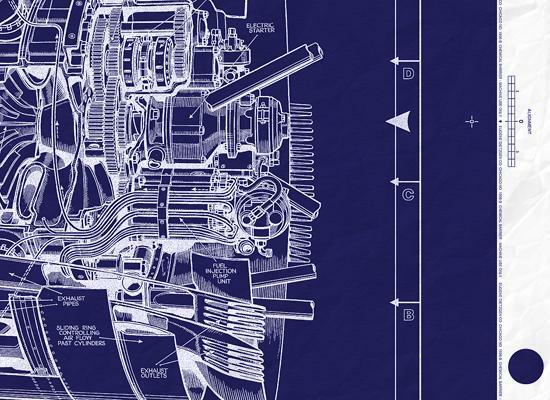 Modifications to the 801 S consisted of an improved and simplified master-control, chrome cylinder liners, modified rocker housing cover, modified piston rings and altered magneto timing. Supercharger Drive Ratios: 6 : 1 and 8.3 : 1. Performance: Take-off and emergency 2,000 h.p. at 2,700 r.p.m. at 1.56 ata. at sea level, 1,700 h.p. at 2,700 r.p.m. at 1.65 ata. at 18,700 ft. Climbing 1,650 h.p. at 2,500 r.p.m. at 1.45 ata. at sea level, 1,500 h.p. at 2,500 r.p.m. at 1.45 ata. at 18,000 ft. Maximum cruising 1,440 h.p. at 2,400 r.p.m. at 1.3 ata. at sea level, 1,340 h.p. at 2,400 r.p.m. at 1.3 ata. at 19,000 ft. Fuel consumption .545 lb./h.p./hr. maximum cruising, sea level. Similar in general construction to the 801 E but fitted with a two-stage four-speed supercharger. 96 Octane fuel. Supercharger Drive Ratios: 4.2 : 1, 5.4 : 1, 6.5 : 1 and 7.25 : J.
Dimensions: Overall length 2,741 mm. Diameter 1,360-1,390 mm. Weight: 1,800 kg. (3,960 lb.). This engine was the 801 I) fitted with an exhaust-driven turbo-supercharger. 96 Octane fuel Supercharger Drive Ratios. 5.3: I and 8.3: 1. Dimensions: Overall length 2,525 mm. Diameter 1,110 mm. Weight. 1,610 kg. (3,542 lbs.). Performance: Take-off and emergency 1,810 h.p. at 2,650 r.p.m. at 1.55 ata. at sea level, 1,500 h.p. at 2,650 r.p.m. at 1.55 ata. at 40,000 ft. Climbing 1,630 h.p. at 2,425 r.p.m. at 148 ata. at sea level, 1,380 h.p. at 2,425 r.p.m. at 1.48 ata. at 38,400 ft. Maximum Cruising 1,330 h.p. at 2,300 r.p.m. at 1.28 ata. at sea level 1,230 h.p. at 2,300 r.p.m. at 1.28 ata. at 40,000 ft. Fuel consumption .536 lb./h.p./hr. maximum cruising, sea level. This engine was the 801 E with an exhaust-driven turbo-supercharger. 96 Octane fuel. Supercharger Drive Ratios: 6 : 1 and 8.3 : 1. Dimensions: Overall length 2,525 mm. Diameter 1,440 mm. Weight: 1,610 kg. (3,542 lbs.). Performance: Take-off (with methanol/water injection and increased boost) 2,270 h.p. at 2,700 r.p.m. at 1.75 ata. Climbing 2,000 h.p. at 2,500 r.p.m. at 1.55 ata. at sea level, 1,715 h.p. at 2,500 r.p.m. at 1.55 ata. at 40,000 ft. The 802 was an eighteen-cylinder two-row radial of similar construction and arrangement to the 801. It had a take-off output of 2,400 h.p. Although this engine was known to have been under development for some years it did not appear in any operational aircraft.